With a snappy flavor and texture, this crunchy and colorful salad is perfect for a picnic or barbecue since it travels so well. In a medium sauce pan, boil carrots for 5-10 minutes or until they reach a crisp-tender state. Drain carrots. Combine the sugar, vinegar, oil, mustard, Worcestershire sauce, salt, and pepper in a saucepan over medium heat. Bring to a boil. Remove from heat and add the tomato soup. 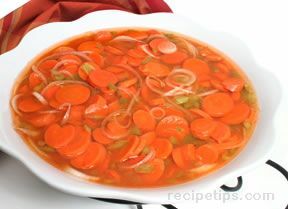 Mix the carrots, onion, and bell pepper together in a large serving dish and pour the sauce over the vegetables. Stir gently to combine and refrigerate overnight. *This salad will keep for up to 6 weeks in the refrigerator.